That was last year’s easter parade ensemble. I generally take advantage of the festivities and time of year to bring the skimmer/boater out of the box. I may do so again this year. 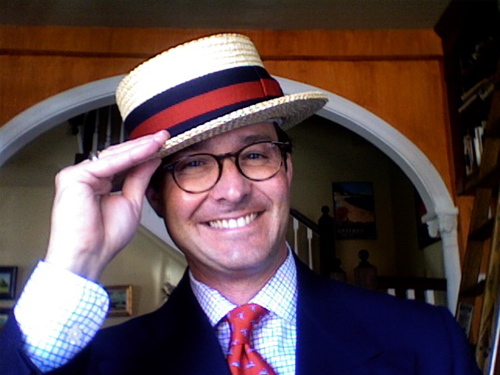 Or I may go for a Panama with the Optima crown or the center crease. Maybe I’ll skip it this year and stand in the shade. I envy the women who will get to wear sleeveless sundresses in light cotton with large brimmed open weave hats and open toed shoes; those who must carry a wrap or sweater inside in order to survive the air conditioned chill. Which brings up the question of what is seasonally appropriate attire for the men? We are not a nation of guayabera wearers by and large and staying cool whilst remaining well-turned out can be a challenge in the warm weather. Invest in a bottle of Gold Bond Medicated Cooling Body Powder and read on. We’ll try and muddle through together. Officially, it’s too early for white clothing. No white linen trousers (or suits), dinner jackets, spectators or white bucks. Reserve them for the summer months between Memorial Day and Labor Day, unless you’re in the tropics. Seersucker. The Architect will tell you that it is too early for seersucker. There’s a lot of white in the weave and so it remains a summer fabric. And it is not yet summer. Madras. Ditto. Summer. Reserve patchwork Madras especially for the noonday sun of summer. Choose, instead, tropical weight wool, as appropriate in Church as at the porch party after. Light greys are particularly handsome to my eye. Paired with a light blue or pink tie perhaps. A pink or crisp white broadcloth shirt will round out the cool effect. Speaking of cottons like broadcloth, your khaki poplin suit is a fine choice. Mel Gibson sweats his way through “The Year of Living Dangerously” in one. The white shirt, black knit tie and aviator sunglasses combination is classic cool in warm weather. And there is always, always, your summer navy blazer. Hopsack, fresco, tropical weight wool and linen help to take the edge off. Pair your blazer with a jaunty and colorful bowtie or a shockingly colorful and whimsical four-in-hand. Above I mentioned that it was too early for white linen. Yes, but I don’t see any reason to shun the fabric altogether, especially in the face of a mounting heatwave. There are a lot of colors from which to choose. Wear a solid or patterned sportcoat or trousers in tan, light blue, olive, yellow, blue or grey linen. Wrinkle away. You’ll be cooler than the masses in heavy denim jeans. I am fully aware that you may be among the minority who have “dressed up” for the occasion. So as long as you’re turning heads, you might as well sport a hat. This entry was posted in Elegantology and tagged Elegantology, Men's Warm Weather Dressing, Monument Avenue Easter Parade, Summer Clothing Rules. Bookmark the permalink. Love this…I pulled out the Old Man’s linen trousers today to get them ready, in black and tan only. Shoes are a problem, though…what will he wear with the linen when it’s too early for Hurachas?? Hi Ami, I stick with tan shoes. Loafers, if casual. And Gold Bond Foot Powder. It’s in the 70s here in St. Louis and I’m already sweating in the sun. I ironed the creases back into my linen trousers sometime last week, and tomorrow might just have to be their seasonal debut. Now to find myself a nice linen jacket…. Hmmmmm . . . this is all very curious. I popped on my black Mountain Hardwear puffy jacket yesterday morning as I drove a friend to the airport in the early a.m. No global warming up north yet. But all of these ensembles sound fantastic! Thanks for the deux April Food Day! Looking forward to it, and having the post up & running tomorrow a.m.
A gentleman always looks good in a hat. I have never tried a skimmer, but maybe this year. You Northern types are always a bit too quick on the draw when it comes to the whites, the seersucker & the linen… please consider how hot it WILL be, in August. What refreshing element of your wardrobe will you look forward to after the seersucker? Sleeveless t-shirts and cut-off jean shorts? The “rules” are there to guide your restraint, like the “rule” against eating a quart of ice cream before dinner, or not finishing the Macallan before commenting on blogs. Can you do it anyway? Sure. Is it better if you wait, and then indulge in moderation? You tell me! Easter is the time to indulge in pastel oxfords, slightly “quirky” ties, and Pork Pie hats. Yours, by the by, is excellent, and I expect your social circle would be disappointed if it failed to make the rounds. As to having the face and huevos to wear it; you’re a better man than I am Gunga Din. Seersucker: Wait. Linen: If you MUST. Easter hat: Absolutely. With admiration & respect to Ami, Huaraches: NEVER. I know you think they look ok – so does Glenn O’Brien. He’s wrong too. Please…think of the children. I love the boater. It is identical to the one I have from Brooks. I have owned it for years and it is hated by the Irish Redhead in the EXTREME. She is embarassed by it. Sigh. This year though, I have a new Brooks Bros double breasted navy blazer with lots of gold buttons. The boater would be JUST the thing…. PS. You “northern type” you. Couldn’t agree more with Mr. E’s recommendations here–we can’t quite pull out sleeveless dresses, but have not doubt, we always take off our cowboy hats, boots, jeans and holsters in honor of Easter. And at my age, I haven’t thought along the lines of jean shorts and t-shirts in . . . well . . . decades. Hope I did not give the impression that we don’t dress up. Monday a.m. it was in the 30’s–hard to get in the seersucker/linen mood just yet–but festive ties and scarves, and even some hats will make an appearance by Sunday morning. Cap’t, one of the best sartorial scenes I have witnessed was off an island in the BVIs. New Year’s Eve and Junkanoo was in full swing. Around the bonfire on the beach road a white haired expat in a rumpled and sweat stained white linen suit worn with Huaraches and a half (?) full bottle of whisky. But that was there and not on the Avenue at Easter. Neither here nor there. But what a memory.